Auditions are just one of the many exciting aspects of being a part of an amateur dramatics society. Yet with emotions running high (as they always do with auditions) it’s essential that everyone involved—directors, organisers and actors, singers and/or dancers—understand how to make the process go as smoothly as possible. To give you and your dramatics troupe an immediate edge (even if you’ve not experienced an audition before), we have some tips and pointers culled from the expertise of individuals who know how to make an audition memorable as well as valuable. For the purposes of this article, we’ll assume that you’ve already chosen the show for which you’ll be auditioning people. Whether your docket includes a comedy, drama, musical, operetta or any other type of theatrical production, you’ll obviously need people who can adequately perform, will commit to coming to all rehearsals and are willing to learn. Consequently, it’s a good idea for everyone involved in the planning of the show to construct a list of the top three or four qualities they want their actors, singers and/or dancers to possess. These could include physical characteristics, such as a female who can realistically be seen as a 20-something regardless of her chronological age and emotional traits, as in an actor who can convincingly cry on cue. Use this list when audition night rolls around; it will help you weed out the ideal performers from those who might be excellent in their own rights, but simply don’t fit your current needs. Speaking of audition night(s), it’s essential to advertise auditions well beforehand so you have a good “crop” of performers from which to choose. Fortunately, you needn’t spend gobs of money putting ads in your local paper if you have an extremely tight budget (as do most fledgling amateur dramatics societies). Flyers hung at local “hotspots” can work very well, as can good, old fashioned word-of-mouth referrals. Some radio stations may even be willing to give your troupe’s upcoming auditions a “plug” for free. 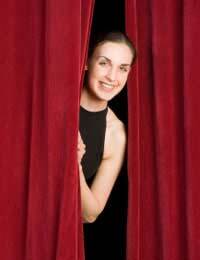 Understand, though, that you don’t necessarily have to look outside your troupe for your performers. You may prefer to hold “closed” auditions, in which members of your dramatics group audition, but no outsiders will be considered for parts unless absolutely necessary. If your group is large enough, this type of closed audition is perfectly acceptable, especially if your society has a play in mind with a small cast of characters that can easily be parcelled out among current members. When you get to audition night, be certain to have copies of scripts available and a pianist or tape player on hand if you’ll be gauging musical talent. You should also have copies of a contact sheet form for all those auditioning to fill out; that way, you can connect with and remember them more easily. With the proliferation of camera phones and photo software, you could even take a picture of all auditioning persons, then attach a copy of each picture to the back of the individual’s contact sheet—this will enable you to even more quickly recall one actor from another. How you actually structure your audition is up to you, but make sure to give it plenty of thought beforehand. Don’t assume that you can “wing it”, as you’ll wind up wasting time and energy… and you may not cull enough information to make a good selection. Even simple aspects of the evening, such as whether you’ll audition people in groups or solo (depending on the type of performance, either can be beneficial) should be prearranged. After auditions, you’ll be selecting your cast, either alone or with a committee of trusted, likeminded people. Take your time and consider different cast options. Incidentally, it can be fun to conduct “what if” scenarios using different people who have auditioned. Expect to be startled… in a good way! When you open your mind to new approaches, the results can be downright amazing! Our amateur group have for many years been putting on pantomimes. Each time someone has to invent ways to achieve the scenery and props. Much ingenuity is required for this and I am wondering if there is a way all people who find themselves short of an idea can discuss what ideas worked, or did not, elsewhere. Photographs may be helpful too. Many thanks for your comments. We hope you get some replies to this, as it would be interesting to know and share.